A month ago, my wife told me that Maddy had a school project to create a new character for the Dr. Seuss family. The character can be drawn on a piece of paper or be done in 2D or 3D image. 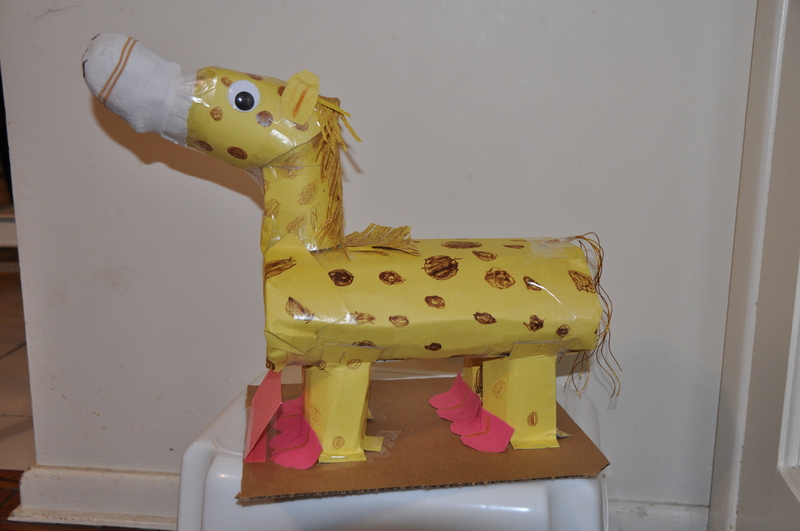 I thought to myself, Why does the school gives projects that obviously the parent will be doing most of the work on? It would be a waste of my time. But I did not want to disappoint my daughter and I went along with it. I asked her to think of a character that she thinks could belong to the Dr. Seuss family. No long ago, Maddy developed a fascination for giraffes. We have a giraffe stuffed toy that says a prayer when you press it, which we bought when our first daughter was born. Maddy decided that it is hers. Since then she has collected a few more items with giraffes on them. When I arrived home the next day, she came to me and told me that she had a character in mind. 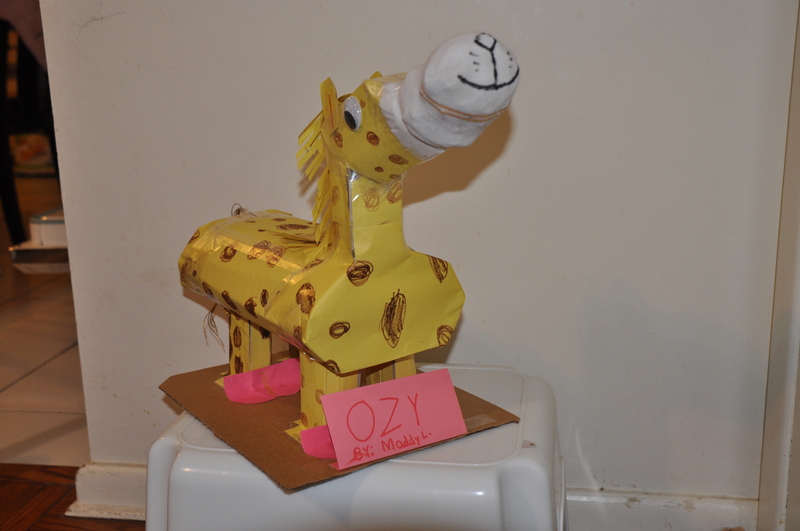 She told me that it would be a giraffe named OYZ (pronounce OZZIE). She declared that I could either draw or make a 2D or 3D character and to let her know when I was ready to work on it. 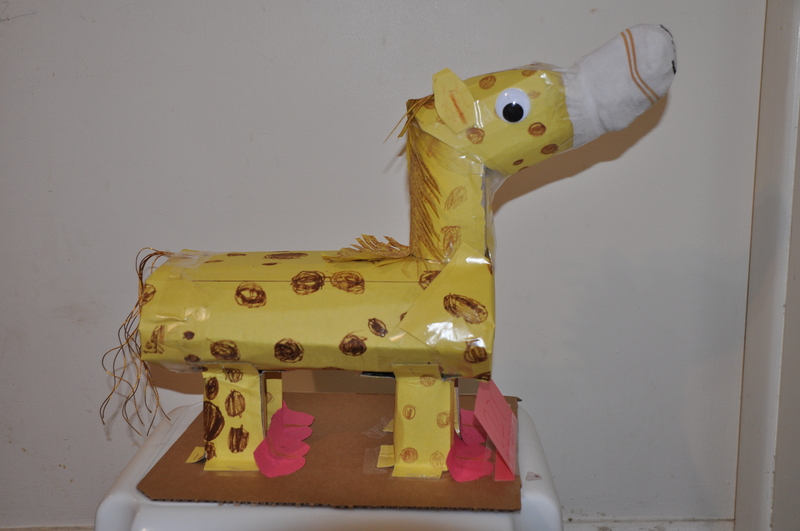 I spent the next three hours thinking how to create a giraffe character that is worthy to be part of the Dr. Seuss family. Before I went to bed, I had an idea what to create. Next day, when I came home I told her to get ready and we gathered our materials and I told her that I needed her help. As we created the character, I would ask questions like, what would the face look like? Faith was intrigued with what we were doing and she decided to join the fun. They would take turns telling me the things they wanted and we would try to create it. Over the next three days, the three of us worked on the project and enjoyed the sharing of ideas. Maddy and Faith would paint the giraffes and determine the size of the spot depending on the body parts. We also added a personal touch by creating a snout using Faith’s old sock. They initially did not think it was a great idea, but later on liked the outcome. Keep an open mind – I initially jumped to the conclusion that I would do all the work and felt burdened by it. After stepping back and thinking it through, I was able to come up with a solution to get them involved. Get them involved – Children are creative and we have to believe that is the case. They see a lot of things and are full of enthusiasm. If they are involved, they will be more engaged. Have fun doing it – Since we kept it fun, I got more out of it. I was able to bond with them and spent quality along the way. Sometimes the journey is better than the end itself – learn to go with the flow and not worry too much about every minor detail. This is very true with everything we do. Sometimes we sweat the small stuff and it makess it hard for us to move forward because we are too focused on things that are not important. In the end, it did not turn out to be a project that the parent worked on, but rather a project that everyone collectively participated in and enjoyed doing. Over the next few weeks, Maddy was proud of her character and she would often compare it to the ones that her classmates brought to school. She would say mine is still the best. The fact of the matter is it meant less to me that our character is the best than the experience that we three shared while working on it. It is something that she will remember for a long long time and to me that is what matters the most. Quality time with your children is so important and what a cute giraffe! This is a great lesson – and one that I have to remind myself of often. I’m sure I’m going to offend someone here but one of my pet peeves is the annual pinewood derby. Here we see young kids turning up with amazing creations, but it is often clear that the only involvement the child had in in the project was carrying it to the start line. When my kids did this I made them do all of the work. I helped them, showed them how to use the tools etc. but it was entirely their creation. They might not have looked as fancy as some of the cars – but they were rightfully proud of them. I’m doing something similar with my son at the moment. He wanted to build a battlebot. We started last weekend and, while I am there offering practical advice on how to accomplish things, he is the one doing all the work. That includes creating the chassis out of wood, soldering wires, and dismantling cordless screwdrivers to use as drive motors. He was nervous about using some of the tools, but now he knows how to do it and is learning about gears and basic electronics, all while having fun. We are only part way through but he is engaged at a level I have not seen before – which is great for me to see. And, like you, I have to rein in my own views and let his creativity run. Frankly, he has some come up with some ideas that are better than my own. Kids have amazing imaginations – as parents, we need to be careful to not crush that and let them soar.